This Christmas I seem to be a little obsessed with Santa’s belly… er, rather crafts that look like Santa’s belly! I recently made these Santa’s belly treat cups, and before that this glittery Santa’s belly jar, and last year I made this super simple Santa’s belly ornament. 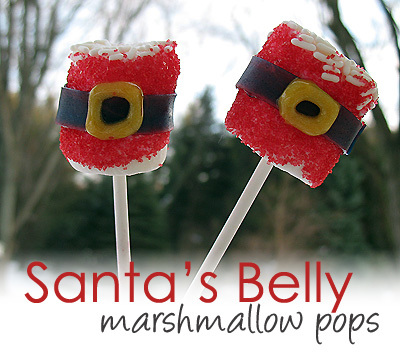 There are lots of edible options for Santa’s belly, but marshmallows just seemed to be a natural choice. Their shape is perfect, no baking involved, and so simple the kids can make them too. My good friend Meaghan over at the decorated cookie made these really awesome Santa’s belly cookie pops too. She’s an amazing cookie creator and decorator. In fact, you’ve probably seen tons of copies of her Mr. Melty melted snowman cookie. Meaghan is the creator of this totally fun confection! 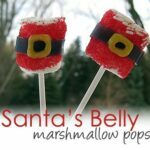 Anyway, I asked Meaghan what she thought of the idea for making these Santa’s belly marshmallow pops. Great minds think alike as she had been thinking of making something similar! We hashed out a few ideas and this is what I came up with. I originally was going to dip the marshmallows in melted red candy melts but I don’t have any and Michael’s is just too far away and I’m impatient. Because of illness in this house I haven’t baked anything in almost two weeks! I needed to do something in the kitchen, anything! I’m sure there are other things you could use, I even thought of dipping a Cheerio in yellow tinted powdered sugar glaze for the buckles, just like I did for the eyes on my Monster Brownies at Halloween. So here’s the easy step by step tutorial. These are fun and cute and tasty too. Hope you like them! Getting ready: Have a small plate with a thin layer of water on it, and another plate for your red sugar and white sprinkles. If working with kids you might want to have separate plates for the red sugar and white sprinkles to avoid mixing them together. Open up a fruit roll up. The flavor I used was called Berry Tie Dye. Half of it is red and the other half is a purplish color. I used a knife and sliced the roll up down the center and just used the purple side. Cut the fruit roll up down the center to make a thin strip. You will want enough to go around the marshmallow and overlap by about 1/4″ or so. Ketty Valenti di Zagara & Cedro. Amanda…you are amazing and creative!! Had to share with my mom who is a santa lover, just how festive and cute this would be as a candy bouquet on the dessert bar. Happy New Year!! 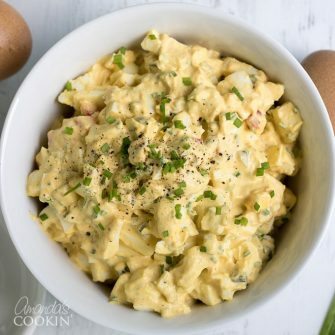 Oh wow, those look simply delicious! And how fun! You do come up with some fabulous ideas!